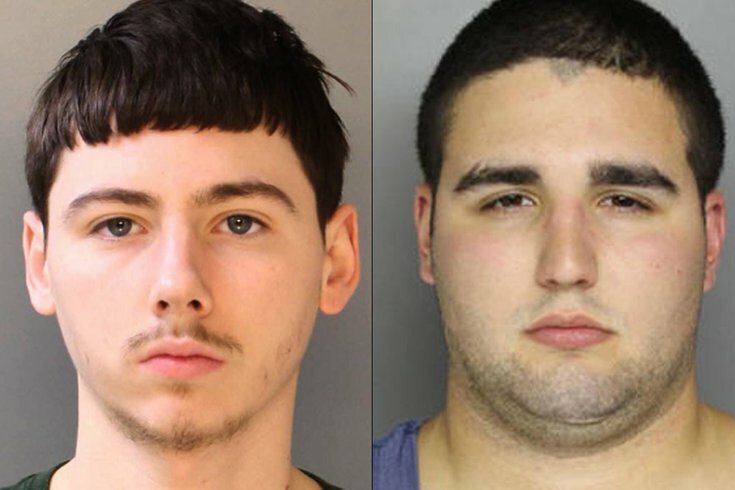 Sean Kratz of Northeast Philadelphia, left, and Cosmo DiNardo of Bensalem, both 20, are charged with murder and other offenses in the slayings of four men in Solebury Township, Bucks County. 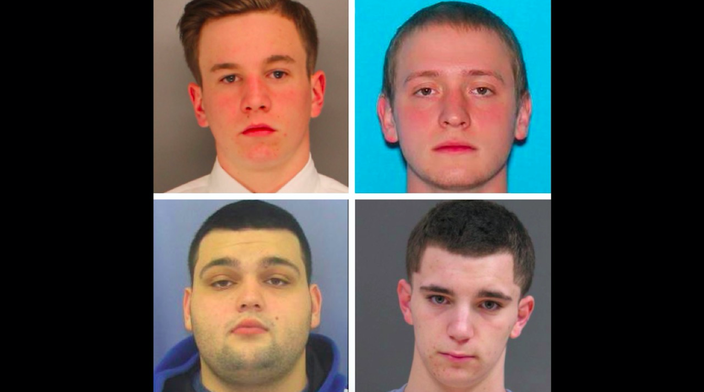 Cosmo DiNardo and Sean Kratz, both 20, have been charged with homicide in the slayings of four men in Bucks County, the Bucks County District Attorney's office announced Friday afternoon. DiNardo, of Bensalem, is accused of killing Jimi Taro Patrick, 19, of Newtown Township, Bucks County on July 5, and burying him in a grave on his parent's farm in Solebury. He allegedly killed three other men two days later. 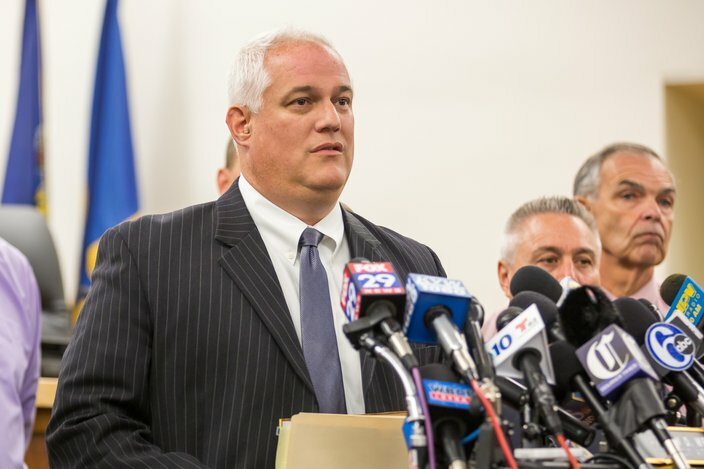 DiNardo and Kratz, of Northeast Philadelphia, are charged with the July 7 slayings of Dean Finocchiaro, 19, of Middletown Township, Bucks County; Thomas Meo, 21, of Plumstead Township, Bucks County; and Mark Sturgis, 22, of Pennsburg, Montgomery County. Their bodies were found Wednesday in a 12-foot-deep common grave on the property discovered by cadaver dogs. Patrick was buried in a six-foot grave on top of a mountain as much as a half-mile away from the common grave, Bucks County District Attorney Matthew Weintraub said at a news conference on Friday afternoon. He said locating Patrick's body on the 80-acre property independently would have been very difficult. Prosecutors took the death penalty off the table for DiNardo in exchange for his cooperation, which led them to Patrick's body. "We'd still be looking for Jimi Patrick if we hadn't made that deal," Weintraub said. Weintraub said DiNardo's confession provided "valuable intelligence and information" that enabled them to charge Kratz. Weintraub said he does not know what led DiNardo to confess. "I don't know what convinced him," Weintraub said. "I'd like to think that he wanted to help us get the boys home." The bodies of the slain men are being held in a secure place, Weintraub said. But they will soon be returned to the families. "We've brought four young men one step closer to their loved ones so that they may rest in peace," Weintraub said. These are the four men murdered on a family farm in Solebury Township, Bucks County. Clockwise from the top left: Jimi Tar Patrick, Thomas Charles Meo, Dean Andrew Finocchiaro and Mark Richard Sturgis. According to the affidavit of probable cause, DiNardo had agreed to sell Patrick $8,000 of pot on July 5, but when he picked him up from his Newtown home, Patrick only had $800. DiNardo then offered to sell Patrick a .22 rifle, bringing him to a remote location and shooting him. DiNardo then retrieved a backhoe, digging a six-foot-hole to bury Patrick's body, the affidavit says. Two days later, DiNardo agreed to sell Finocchiaro a quarter of a pound of pot for $700 and picked him up from his Middletown home with Kratz, who DiNardo told authorities is his cousin. DiNardo allegedly gave his cousin a .357 handgun that belonged to his mom and drove Finocchiaro back to the farm. There, Kratz allegedly shot him as he left a barn on the farm. DiNardo shot him a second time after he fell to the ground, according to the affidavit. Kratz alleges that DiNardo shot Finocchiaro, the affidavit said. Later that day, DiNardo met Meo and Sturgis in Peddlers Village for another pot deal. Meo and Sturgis followed Dinardo to the Solebury farm in Meo's Nissan Maxima. After they parked the Nissan at 2827 Aquetong Road, Meo and Sturgis rode with Dinardo in his truck to the adjacent Lower York Road property, where Kratz waited, officials said. DiNardo then shot Meo in the back with the handgun, later shooting Sturgis as he ran away. Dinardo then ran over Meo with a backhoe before using it to lift both Meo and Sturgis' bodies into a metal tank where he already had placed Finocchiaro's body. In his confession, Dinardo referred to the tank as the pig roaster. Dinardo told investigators he then poured gasoline and lit the tank, according to the affidavit. One day later, he and Kratz returned to the farm and used the backhoe to dig a deeper hole and buried the metal tank. Weintraub said there was an attempt to burn the bodies, but investigators do not believe it was successful. He said he does not know why DiNardo killed the four men – an answer many are searching for. "I'm not really sure if we can ever answer that question," Weintraub said. Police have recovered both weapons used in the murders, he said. Weintraub praised the efforts of investigators, who have worked in shifts around the clock since Sunday to locate the bodies. He displayed a bouquet of flowers – sent by a member of the community – that he intended to distribute to as many law enforcement officers as possible. "I feel a lot of sadness," Weintraub said. "I feel relief. I feel so proud of my team and I feel resolve. Because although we've sped through this week, and we've accomplished so much, there's so much more to do to bring justice to this case."